Afghanistan have asked to be given a chance to face higher ranked teams regularly, after qualifying for the ICC (International Cricket Council) Twenty20 World Cup for a second consecutive time. The team, led by Captain Nawroz Mangal, hammered Namibia by 47 runs, much to the delight of approximately 3,000 loyal fans at the Dubai International Cricket Stadium, to clinch the first of two spots available for the event, which is to be held in September. He added that Afghanistan had proved themselves as worthy contenders, and that they were ready to take their game up to the next level. In 2010, Afghanistan were granted ODI status by the ICC, but fell just short of qualifying for the 50 over World Cup. However, they were given an opportunity to prove their worth, when they clashed with Pakistan, who beat them comfortably by seven wickets at Sharjah. Afghanistan coach, Kabir Khan, stated that the success of the team was starting to have a positive effect on the war-torn country, and he hoped that the sport would also help to reunite the people. “It is a moment of big happiness for me, the country and the future of the country’s cricket. Cricket is a positive thing, sport always helps with peace” he said. Since the team qualified for the 2010 Twenty20 World Cup in the West Indies, the popularity of the sport has greatly risen amongst the youth of the nation. 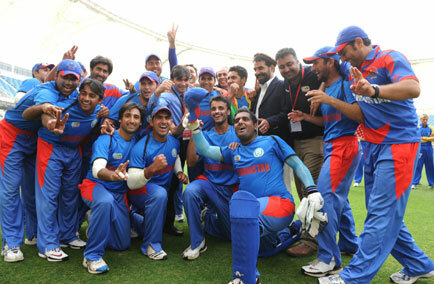 “In Afghanistan, cricket is playing a big role in peace. With the youngsters, the statistics have about 70,000 youngsters registered with us” said Khan. With Afghanistan now guaranteed a spot, Khan, is looking to put together the best team possible, in order to progress as far as possible in the tournament. This entry was posted in Uncategorized and tagged Afghanistan, cricket, ICC Twenty20 World Cup, Kabir Khan, Nawroz Mangal, qualify. Bookmark the permalink.